I’m a mechanical engineer with a post graduate course in Marketing; before joining RS in 2010 I worked with AgustaWestland helicopters on the NH90 military program and at Meritor HVS as product strategy manager for Europe and South America. RS Components, Siemens and Massimo Banzi, co-founder of Arduino, presented a new Industrial IoT device to the market called SIMATIC IOT2020 during the last Maker Faire in Rome. This device supports engineers, makers, and designers of the future. By 2020 it is estimated that there will be more than 10 billion devices connected to the internet. Siemens developed SIMATIC IOT2020 in collaboration with RS Components, and it’s compatible with the most common open source platforms like Arduino. Sinclair: What is SIMATIC IOT2020? Carnovale: SIMATIC IOT2020, an open industrial IOT Gateway aims to support students, makers, and young developers to familiarize with the IIoT and scale up their prototypes developed with open source development boards like Arduino, Intel Galileo, and Raspberry PI. IOT2020 is not a logic controller. It aims to be the brain of every IoT application by collecting data, via its various communication ports, from PLCs, drives, and sensors located everywhere in the world. In any case students and makers can get IO capabilities by using the Arduino connectors or using many of the existing Arduino shields. Sinclair: Why an Industrial IoT hardware compatible with Arduino and other open source ecosystems? Carnovale: IOT and Industry 4.0 are two global trends that will change the world in the next five years. In RS, distributing both Industrial and Electronics components and serving students, makers, and Industrial engineers, we realized that there is a technology gap in the way students and makers approach IoT compared with the Industrial world. Students and makers, everywhere in the world, learn high-level programming languages and start developing their first IoT applications by using open source IDEs and hardware thanks to the flexibility of such kinds of platforms. Industrial engineers develop home automation and industrial applications by using hardware with industrial standards, industrial protocols (MQTT, MODBUS, and PROFINET) and propriety programming languages. IOT2020 builds a bridge between the two worlds by combining the flexibility of the open source ecosystems and high-level programming languages, with the standards and reliable protocols typical of the industrial world. Students can then easily move their prototype into the automation panel and start connecting their project to the other existing industrial systems by using what they have already developed on the bench with open source boards such as Arduino. IOT2020, thanks to industrial certification, can also help makers scale up their IoT prototypes to a commercial application by reusing the open source code and web interfaces developed with open source prototyping boards. Sinclair: Do you think that open source software and high-level programming languages are better than the standard proprietary languages of the leading automation brands? Carnovale: We strongly believe that we must give choices to the engineers, according to their skills and the applications they want to develop. For the most common industrial applications, the proprietary programming languages allow quickly building the program and interfacing the hardware with other components from the same brands. But in many cases, especially in IoT applications where the project could require using different hardware from different brands, the open source software, and high-level programming languages provide an incredible flexibility. Sinclair: What does it mean, SIMATIC IOT2020 is an “Industrial hardware”? What is the difference with the regular development boards such as Arduino? Carnovale: UL and CE certification is only one of the many requirements that make IOT2020 suitable hardware for industrial applications. 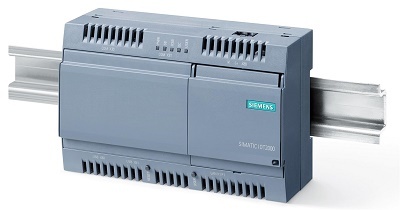 IOT2020 is developed with an industrial IP20 housing and with connection interfaces that allow it to be installed safely installed in machinery or an electrical panel, and to be connected with other DIN rail industrial devices such as PLCs, power supplies, relays, and motor drives. Moreover, IOT2020 is built with industrial grade components that allow it to operate 24/7 in an industrial environment with vibrations, dust, high temperatures, and electromagnetic interference. Regarding communication protocols, IOT2020 can communicate with other industrial hardware by using secure industrial protocols such as Modbus, PROFINET, and MQTT. The typical open source development boards are usually not developed for continuous operation in an industrial environment and are not designed to interface easily with other industrial devices. Sinclair: Can you provide some examples of uses of the SIMATIC IOT2020? Carnovale: A possible example of an educational application is the prototyping of a remote control and monitoring system for an Industrial robot arm. Students can start developing the IoT system and the web interface on the bench by using an Arduino Yun board and then, in a second step, move the code into the IOT2020 to continue the prototyping phase in the automation panel of the robot arm to complete the systems integration. IOT2020 can be used to collect data from sensors, PLCs and motors drives located everywhere in the world and then trigger actions on the robot by sending data to its PLC and motor drives via the Ethernet port. A possible application of the IOT2020 for makers is to scale up a home automation prototype to a commercial application. For instance, an access and lighting control system developed with an Intel Galileo board can be transformed easily into a certified application with the IOT2020 and then securely installed in the electrical panel and interfaced with the electrical circuit of the house. The prototyping phase can then be moved from the bench to the electrical panel by using the Arduino shields to start interfacing the project with the other electrical devices. The application can be finally industrialised by using industrial timers, PLCs or relays, connected via the Ethernet or mPCIe ports, instead of the Arduino shields. Sinclair: What’s the next step? Carnovale: As happened with Arduino and Raspberry PI, it will be the users' community that defines the next steps based on how they will use IOT2020. One of the possible scenarios is the development of industrial-grade Arduino compatible shields to simplify the transition from prototype to commercial application.